The new strategy for the positioning on the market of companies, as introduced by the 2015 edition of the most widespread standards of management systems certification, the only valid since September 15, 2018. To own a quality management system certified under accreditation, according to UNI EN ISO 9001 standard, and an environmental management system certified under accreditation, according to the UNI EN ISO 14001 standard, represents an opportunity for growth for the company, and the advantages deriving from certification involve many aspects of the company’s activity. The organizational efficiency brought about by the certification of quality and environmental management systems derives also, and above all, from the involvement of the different levels of the organization in achieving a common goal and from the standardization of most of the internal procedures. Moreover, management systems provide an incentive to innovate through the activation of new investments. Furthermore, certifying the environmental management system favors the improvement of the reputation and relationships with the stakeholders, with positive effects on the competitive positioning of the company and guaranteeing access to new markets. The certification of the management system according to the ISO 9001 and ISO 14001 standards, therefore, has a high strategic value for companies. It is no coincidence that they are still among the most widespread certifications in Italy. In June 2018, the 95 accredited bodies for the certification of quality management systems certified about 122 thousand company sites, while the 40 competent bodies for the accreditation of environmental management systems had certified just under 22 thousand. From the analysis of the ISO Survey, conducted annually by ISO (International Organization for Standardization) to detect the spread of management system certifications all over the world, Italy is first in Europe and second in the world for the number of certificates valid for the ISO 9001 and ISO 14001 standards. Quality and environmental management systems have therefore been a priority for many Italian companies for a long time, and their market, especially for the UNI EN ISO 9001, is in a phase of maturity of its life cycle, where the annual trend of certified sites demonstrates this trend. Since September 15th, only the new 2015 editions of the quality and environmental management system standards are valid, to which the companies have had to adapt the previous certifications UNI EN ISO 9001:2008 and 14001:2004. The transition set by the IAF (International Accreditation Forum) was completed, with a single deadline for companies certified to ISO 9001 and ISO 14001 worldwide. The new ISO 9001:2015, with particular emphasis on the customer-company, moves in a business direction, trying to meet the needs of customers and striving to exceed their expectations. The task, necessary, to make companies perceive, even those of small size, that the certification is a value, a strategic tool capable of making an important contribution to the improvement of the company’s efficiency is thus fulfilled. The concepts and principles described in the standard give the management the ability to overcome the challenges presented by an economic context that is profoundly different from that of just a few decades ago, characterized by rapid changes brought about by greater market integration than in the past. With reference to ISO 14001:2015, particular attention is paid to the constant improvement of the environmental performance of the organization itself. As a newness compared to the previous edition of the standard, the organization is called to analyze the “causes” that affect its ability to achieve what is established. Some of those causes certainly include the environmental conditions and their changes, but the technological, financial, political, social, etc. context must also be considered. 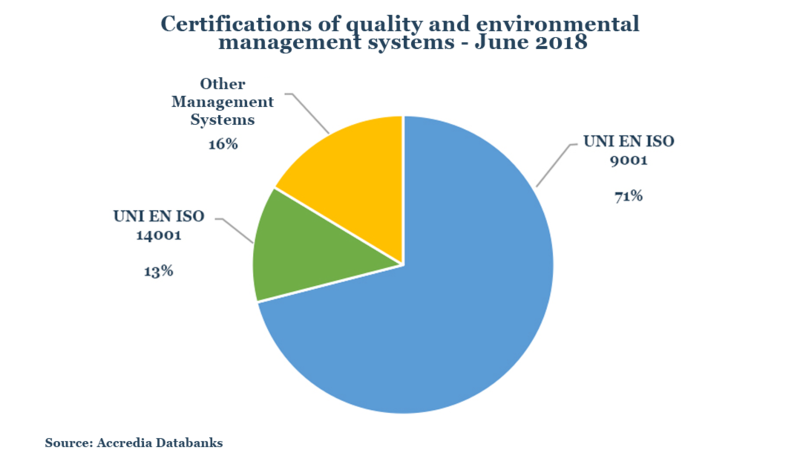 As for the new UNI EN ISO 9001:2015, also for the environmental management system the leading role of the organization’s High Management is strongly affirmed. An interesting newness is the obligation for the High Management to support the other management roles, involved in the operation of the management system, in affirming in turn their “leadership”. Starting from these considerations, the new standards promote an organic and dynamic approach that leads the certified organization to create value. The companies have therefore carried out this adjustment process with the support of the accredited bodies that since March 15th had to plan the verifications for the first certification, the surveillance or the renewals, only according to the new standards. 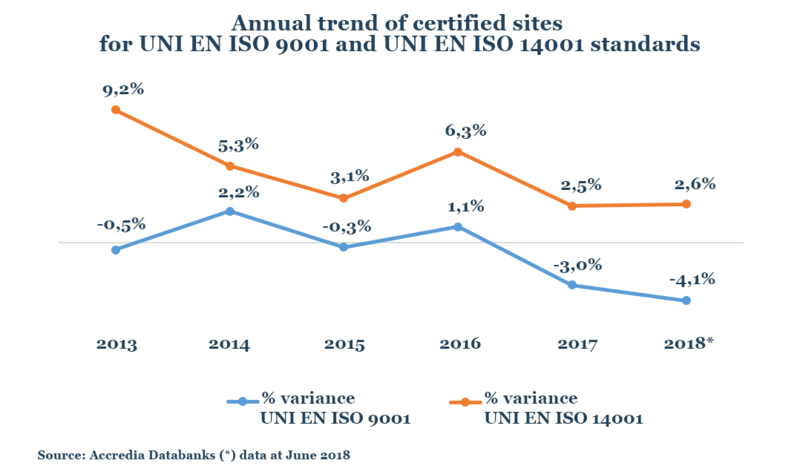 To date, the transition rate of the certified sites for the new standards is 93% for the UNI EN ISO 9001:2015 and 97% for the UNI EN ISO 14001:2015. Percentages in line with what has been detected worldwide: 93% for ISO 9001, and 94% for ISO 14001. A few months before the deadline, this is a positive sign for Italian companies.